Members of 15th Field Artillery including Honorary Lt.-Col. William Rodgers (L) and Honorary Col. Grant Smith are preparing for a massive earthquake drill. Vancouver’s civilian soldiers want their upcoming participation in a massive earthquake drill to showcase what they would do for the city in an emergency. While it’s not common knowledge, Vancouver has a substantial military presence, says Honorary Col. Grant Smith of 15th Field Brigade, Royal Canadian Artillery. The regiment, part of 39 Canadian Brigade Group of the 3rd Canadian Division, was formed in 1920. In the Second World War it manned heavy artillery protective forts once located along the West Coast to protect the Port of Vancouver. Following the end of the war, the brigade turned its attention from the water inland and became a field unit. The regiment was originally based out of the Vancouver Horse Show building near Stanley Park. Today 15th Field is located at the Bessborough Armoury on West 11th Avenue near Arbutus Street. “In today’s world it’s the role of reservists to aid civil authority,” said Smith, a retired Vancouver Police Department officer. He added that besides raising money for the 15th Field Regimental Trust Society, one of the goals of a large event planned for Jan. 29 in Richmond is to raise awareness about what the regiment does and is prepared to do in case of emergency. The Big Shake, as the event has been dubbed, takes place at the London Aviation Centre at YVR where guests will be greeted and handed a red, yellow, green and black armband before heading to triage, where first responders will assess their mock injuries. The private hangar will be set up as if in response to an actual earthquake. Members of the 15th Field Regiment will assist with triage, inspect the building for damage, assist with communications and logistics, and act as security. On hand will be members of the military, ambulance, fire and police from across Metro Vancouver to demonstrate how first responders would react in case of a real emergency. Guests will be served food on tin plates, but shouldn’t expect ration packs. The Scottish-themed menu, in honour of poet Robbie Burns, includes haggis. Honour House founder and former park board commissioner Allan De Genova said 15th Field Brigade is ready to deploy at any time. 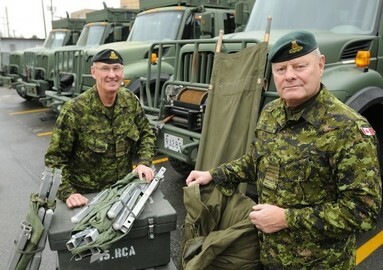 “People across the country should be proud and thankful of what reservists do every day,” said De Genova, who’s been working with 15th Field Regiment as a volunteer. As president of Honour House, De Genova sees first-hand the sacrifices citizen soldiers make for their country. Honour House is a New Westminster-based home-away-from-home for Canadian Forces personnel, emergency services personnel and their families while they’re receiving medical care and treatment in Metro Vancouver. De Genova used the devastating floods in and around Calgary last year as an example of when reservists help at home in times of emergency. “They do so much every day, but a lot of people don’t realize it,” said De Genova. The City of Vancouver is not taking part in the Big Shake, but offers free workshops through the Neighbourhood Emergency Preparedness Program. The workshops are two hours long and held regularly in community centres across Vancouver. The city also continues to develop business programs to support preparedness in small and medium-sized businesses.